My dad is my hero, so when he was diagnosed with chronic lymphocytic leukemia (CLL) in 2002, I joined Team In Training to make a difference. I participated in a couple different events including America’s Most Beautiful Bike Ride and the San Diego and Las Vegas Rock ‘n’ Roll Marathons, which my wife completed with me as well. In 2010, my dad passed away after he developed myelodysplastic syndrome. In 2013, I was diagnosed with cancer myself – stage 4 Hurthle cell carcinoma, a rare and aggressive form of thyroid cancer. I underwent a plethora of procedures including a 10-hour neck surgery, a thyroidectomy, a parathyroid transplant, and I had 100 lymph nodes removed. Miraculously, just six weeks later I was able to return to work as a professional musician for Donny & Marie. In 2015, shortly after registering for my first triathlon, I was diagnosed with metastatic thyroid cancer to the brain. There are only a few documented cases in the world. I had to be airlifted to UCLA where my surgeon, Dr. Neil Martin removed my second vertebrae to gain access to my brain stem. Only a handful of surgeons in the U.S. are qualified to attempt such a procedure. He told my wife that my training had helped prepare me for surgery of this magnitude. 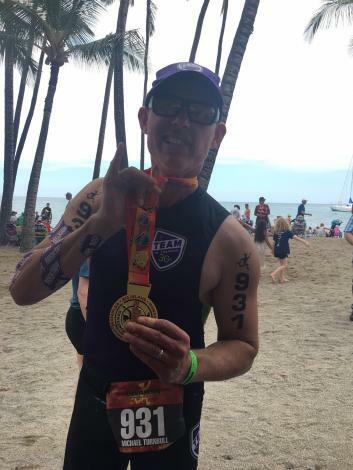 It has taken more than three years of intense physical therapy and training, but I’m proud to say that on March 25, 2018 I completed the Lavaman Triathlon and was awarded a Triple Crown!